If you've attended the D23 Expo (or really any large convention) you know how overwhelming it can be with everything happening all at once. Everywhere you look there's some celebrity signing, activity, panel, game, presentation, exclusive merch giveaway, etc. going on. It's literally impossible to see, do and get it all! 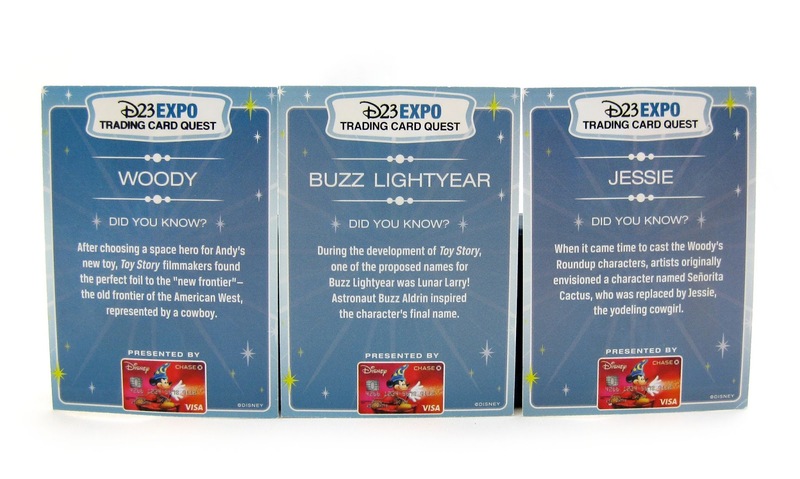 That being said though, I was able to be involved with many cool happenings there at the expo...one of them being the "Trading Card Quest" presented by the Disney Visa Card! I had a lot of fun with this; and as I've mentioned before, I love me some convention freebies! Here's how it worked: everyone got a starter pack of exclusive Disney character trading cards in the back of their D23 Expo booklet/souvenir guide (that was handed out upon arrival, see mine below). I believe that the pack started you off with about six cards (or so) out of the 30 to collect. 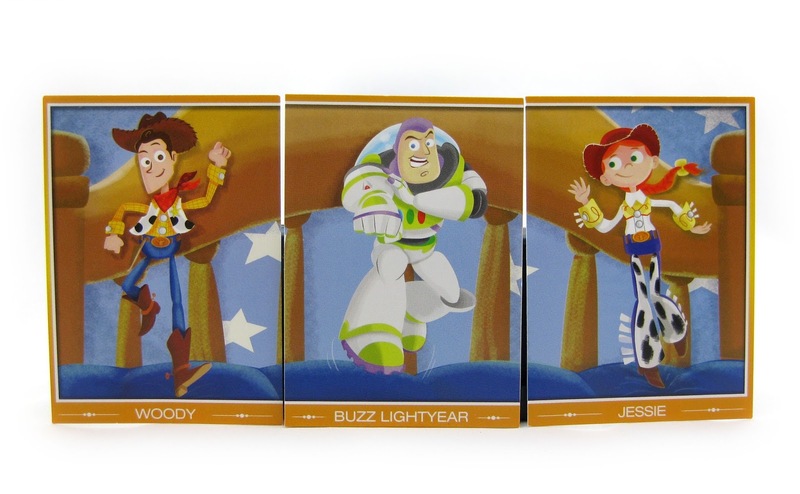 Over the three days, various booths and areas of the exhibit hall gave out different character cards during different times of the day. A star icon on the map indicated locations handing them out, but you kind of just had to be in the right place at the right time. Check out the checklist of characters below! Now I'll take you back a little to tell you about my experience with this. When I arrived at the expo, I had no idea about this "quest"; but during my first visit the official Pixar Studios area, a cast member handed me the Woody card. I didn't know what it was, but hey, it was a Pixar handout so of course I accepted! Later on, one of my buddies let me know more about the trading cards and informed me about the starter pack and checklist in the back of my guide. As a side note, I was glad to see that there were only three Pixar characters (Woody, Jessie and Buzz) out of the 30 available. Since those were the only ones I was interested in, it made the quest much less overwhelming for me. I would have gone bonkers trying to track many more of these down, being the completest that I am. Anyway, I excitingly opened up my starter pack to see who I got and sure enough...there was Jessie! Two down, one to go. At the very end of the second day (Saturday), I searched everywhere for the Buzz card. Unfortunately, I found out he had already been given out that day at some obscure area earlier on. I had missed it! I then randomly stumbled across the "Trading Card Quest Headquarters" where I saw tons of people trading their duplicates. Yah, I walked right in there like I owned the place. After talking with several people, I found someone with a Buzz...but getting him would come with a price. The guy was willing to trade me Buzz, but for another specific character he needed. Long story short, I happened to have the card that he was after (from my starter pack) and we ended up making a fair trade! It was awesome. Again, it was all about the right place, right time and, in this case, right person! I absolutely love the minimal illustrations on these cards and think it's pretty cool that they form one coherent image when put together. As seen above, it's also neat that there are some "Did You Know?" facts on the back of each one as well. Great stuff! It was a fun part of the expo for me. 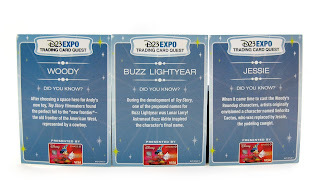 If you're interested in finding these D23 Expo exclusive cards for your collection, check out eBay HERE using this direct link to current listings. Best of luck on the quest!